Egypt and Gaza missiles: How Iran’s Fajr-5 rockets are smuggled to Hamas. Egypt boasts of making peace in Gaza, after letting in the Iranian missiles that provoked the war. 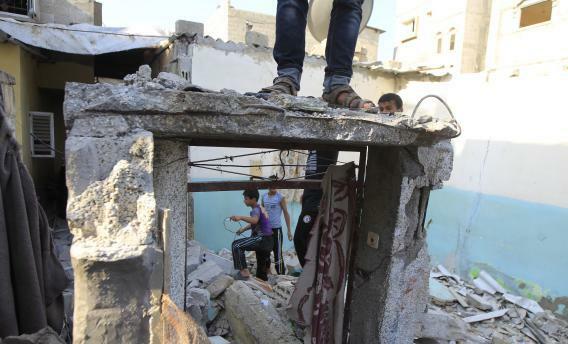 Palestinian boys amid the rubble of a damaged house targeted by an overnight Israeli air strike in the southern Gaza Strip town of Rafah on Tuesday. Photo by Said Khatib/AFP/Getty Images. In the battle of Gaza, Egypt is the fact-checker. Egypt is the referee. Egypt is the peacemaker. That’s what Egypt says. But Egypt is none of these things. What Egypt has done, at best, is to douse a fire that was ignited and fed by Egypt. According to the New York Times, at a weekend briefing in Cairo, Egyptian officials “sought to blame Israel for the conflict while at the same time maintaining Egypt’s role as an intermediary pressing both sides for peace.” A senior Egyptian official, quoted by the Times, accused the West of “double standards” for embracing Israel’s, but not Gaza’s, right to self-defense. The official said “the blame should be directed toward the occupation,” and he chided Western media for reporting that Hamas had fired “rockets” when in fact Hamas was only launching crude “projectiles.” On Tuesday, Egypt’s state news agency boasted that thanks to the ceaseless diplomatic toil of Egyptian President Mohamed Morsi, “the farce of Israeli aggression” would soon end. Oh, yes. Do tell us all about farces, projectiles, aggression, blame, and double standards. Why did Israel launch airstrikes in Gaza? Look at what the strikes targeted: Fajr-5 missiles, their launching pads, and their crews. Why target these missiles? Because they can fly 47 miles and carry warheads of nearly 400 pounds. They can hit Tel Aviv and Jerusalem. Hamas reportedly fired four such missiles at Tel Aviv this week. An Israeli ground invasion of Gaza, if undertaken, would aim to destroy the remaining missiles. Weapons that are smuggled to Gaza come mostly from Sudan and recently from Libya during the security vacuum that followed the revolution in Egypt. Bedouin who are involved in arms smuggling receive the weapons from Sudan on small fishing boats through the Red Sea and by land through rugged mountain terrain only familiar to them and are almost impossible to intercept by security forces who have little power over the Bedouin community. The weapons that are smuggled to Gaza are mostly Grad missiles, anti-aircraft missiles, and recently during the Libyan revolution, advanced shoulder held anti-tank missiles came through. Menai also says it’s very likely that the long-range Fajr-5 missiles have been smuggled through from the Egyptian side, “most likely hidden among other merchandise that is loaded onto big trucks that go through the big tunnels. … Military intelligence officers stationed in North-Sinai turn a blind eye when it comes to the multimillion-dollar tunnel business, and many of them at different ranks receive bribes,” he told CNN. The flow of weapons into the Gaza Strip continues, according to sources familiar with the Palestinian resistance logistics, despite the ongoing Israeli assault … These weapons usually begin their journey in Iranian or Syrian ports. From there, they head to Sudan, where they are transported to the Sinai in Egypt and end up in Gaza. … Sources told Al-Akhbar that the focus is now on transporting large quantities of long-range missiles, considerable numbers of which have already reached the Strip since the beginning of the Israeli assault. Egypt could choke off weapons traffic to Gaza if it wanted to. In 2009, after Israel’s previous clash with Hamas, Egyptian dictator Hosni Mubarak closed his border with Gaza and increased military patrols near Sudan to curtail smuggling. But Egypt’s new Islamist government champions the right of Gaza to “resist” Israel. The Guardian reports that in recent months, Israel has asked Egypt to stop the flow of weapons from Libya and Sudan. Egypt claims to be trying, but an Egyptian security official pleads that it’s hard to stop smugglers in the Sinai since Mubarak’s security apparatus was dismantled. Please. Each Fajr-5 is 18 feet long and weighs a ton. As the Times points out, “the trucks carrying them across Egyptian bridges and through roadblocks into Sinai would be hard to miss.” So let’s hear fewer lectures from Egypt about seeking peace in Gaza. If Egypt were doing its job, this war would never have happened.